Wondering what to have for dinner? Had a busy day and don't have the energy to make something from scratch? Why not go online and see which Indian takeaway is open now? 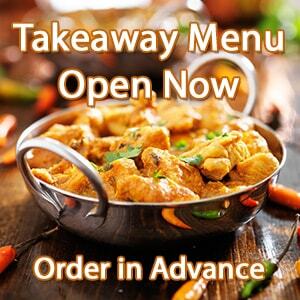 Our curry takeaway website is open now, and always open, offering you many great Indian takeaway options and we look forward to receiving your order. You can order directly from us at Ali's Balti any time, and our easy to use website makes it simple and fast to order whenever you like, on desktop or on mobile. You can order your favourite curry or Indian takeaway at any time – even 3am! Our kitchen is open for takeaway 5pm to 11pm everyday, but the great thing is our online takeaway is always open – you can order in advance for collection / delivery at any time. Click here take a look at the menu with our delicious range of curry dishes and more, and place your order online now. Ali's Balti in Corby is a family business and have been in food industry for 35 years specialising in freshly made modern Indian cuisine and British gourmet food. Ali's Balti serves fresh, scrumptious Indian curry and best of all, it is open now! Using their website www.alisbalticorby.co.uk, you can have delicious food delivered to your door.